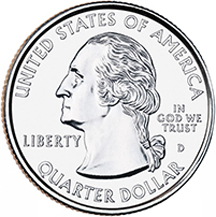 Released on August 7, 2000, this is the ninth coin released in the 50 State® Quarter Program and the fourth released in 2000. New Hampshire, admitted into the Union on June 21, 1788, themed the coin, Live Free or Die/The Old Man of the Mountain. 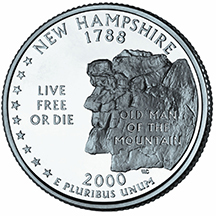 It highlights the rock formation, The Old Man of the Mountain, and the state motto, Live free or die. 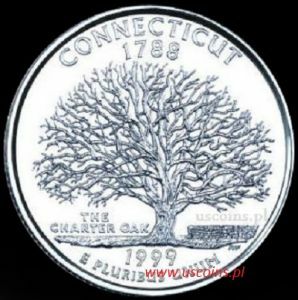 The coin is inscribed: New Hampshire; 1788; 2000; and E Pluribus Unum. President William J. Clinton was in office when this legislation was signed. Three United States Mint Directors served under President Clinton's tenure; David J. Ryder of Idaho, Philip N. Diehl of Texas, and Jay W. Johnson of Wisconsin. Highlights a bust of President George Washington. The inscriptions on this coin says, United States of America, Liberty, In GOD We Trust, and Quarter Dollar.